Prunes are ready for harvest by mid-August. The fruit is shaken from the tree mechanically, collected by fabric catching frame, and transferred to bins by conveyor belts. The bins of prunes are then transported to the prune dehydrator. At the dehydrator the bins of prunes are dumped one at a time, washed in water, placed on wooden trays, and tunnel-dried to about 21% moisture. When dry, the prunes are then scraped off the trays and placed in storage bins. After a few days the prunes are turned into an empty bin to cure the dried fruit. This process continues until the fruit is about 18% moisture. The prunes are then graded for size and inspected for quality. The inspected fruit is then returned to storage until an order is received. 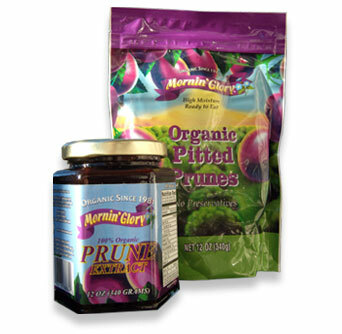 Our Mornin' Glory® Moist Pack Pitted Prunes and our Mornin' Glory® Organic Prune Extract can be purchased directly by consumers. The rest of our organic prune products are available Wholesale. Butte Shadow Farms Prunes and Mornin' Glory® Organic Prune Juice are distributed nationwide by the United Natural Foods Wholesale distributors. Our products are in stock at your local health food stores and are also available in Western Canada, Japan, and Europe. If you are unable to find our product please contact us and we will try to help you find it. Please call us or use the Contact form to order. You can find more contact details and phone numbers on the Contact page. Thank you!